Began the day with a talk to 250 KU college students. Was escorted to campus by State Senator Marci Francisco, who joined me on her bike (she meant roughly 20,000 undergraduate students). Good reception to the “100% by 2020” message, followed by some stimulating one-on-one conversations. Hugs I received by a couple of the students afterwards were priceless. Afterwards rode down to the Sunflower bike shop to show off the trike, where I was told the staff would appreciate it (they did). On the way, was treated to lunch by Craig, who runs a sidewalk food stand – thanks, brother! Got second lunch at nearby Local Burger (the name says it all), where I had a stimulating conversation with the owner, Hilary Brown. I think she’s really onto something with her healthy, local burger joint, so keep your eyes on Local Burger. Overheard one of Hilary’s customers, Dave Yates, talking about coal plants, and after learning he was a local sustainability leader, decided to interviewed him as well. 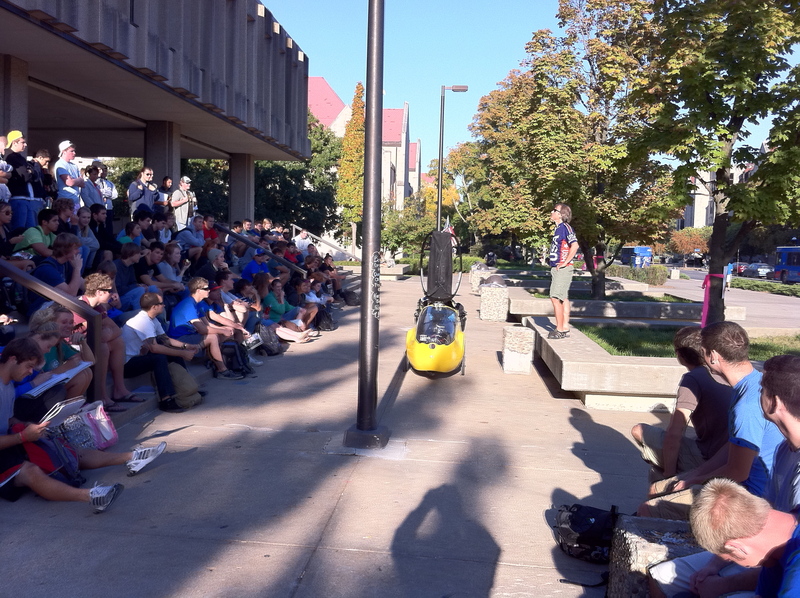 Later in the day, rode 6 miles with the KU Bike Club on one of their standard afternoon rides. One of the students, Jeff Miller, shared some profound observations the importance of communal engagement. Then rode to the outskirts of town for a pot luck put on by the student group, Environs, but that turned into a wild goose chase. Eventually abandoned the effort and rode back into town before it got too dark to ride. Ran into Brian (who I had met at Marci and Joe’s the night before) on his bike on the way back into town, who was up for a couple cold, local microbrews at Free State Brewing Company. It’s hard to picture someone as bubbly and upbeat as Marci operating in a formal setting like a state legislature. She must really liven that place up. I learned tonight she not only bikes everywhere, but is such an avid recycler, she stops to pick up cans she sees along the road (and even recycles staples)! I can tell you from personal experience I had trouble finding a single garbage can in her home. Now that’s walking the talk. This entry was posted in 2010 Ride, Articles, Blog, Video and tagged kansan.com, ku bike club, ljworld, local burger, ride for renewables, university of kansas. Bookmark the permalink.